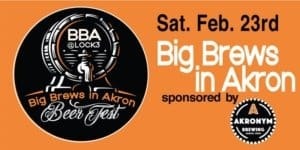 Big Brews in Akron Beer Fest | Thirsty Dog Brewing Co. This is a mid-winter festival and we are bringing out the “Big Brews in Akron.” Be prepared to drink Barley wines and Imperial Stouts, along with other rare and/or Barrel Aged beers. These breweries will be bringing out their biggest and best offerings – you won’t want to miss out! Tickets are limited so make sure to get yours ASAP!